LONDON, UK & ARLINGTON, VA – SEPTEMBER 30, 2015 -- Following the success of the ground-breaking BIG BLUE LIVE multimedia television, digital and social event that unfolded over two weeks from Monterey, CA, the BBC and PBS announce four new co-productions as part of their overall partnership deal signed earlier this year. These exciting new programs from the award-winning BBC Natural History Unit and PBS include THE GREAT RACE, a blue-chip series following animal migration; KOKO, a chronicle of the extraordinary life of the gorilla named Koko and Penny Patterson, PhD, who has dedicated her life to Project Koko, the world’s longest ape-language study; MOUNTAINS, which will use innovative technology to take the audience closer than ever before to some of the world’s most iconic ranges; and, NATURE“Natural Born Hustlers” (which will air on BBC as World’s Sneakiest Animals,) which examines some of the tricky survival strategies of lions and other species. Tom McDonald, BBC Head of Commissioning Natural History and Specialist Factual Formats said, "Our creative partnership with PBS has already got off to a resounding start with the epic BIG BLUE LIVE this summer. I'm thrilled to be announcing a new set of titles with PBS which exemplify our appetite to deliver real scale, originality and innovation -- titles which could only be achieved through such a close alliance and a shared editorial vision. Whether it's a stand out single film like KOKO; a migration series with a technological twist or a visually innovative landmark like MOUNTAINS, I'm hugely proud of the range of form, tone and style that we're offering BBC and PBS audiences in Natural History." THE GREAT RACE follows three iconic species — caribou, zebra and elephant — on three of the world’s most breathtaking wildlife adventures. Each must overcome immense obstacles, from challenging terrain to hungry predators and sheer physical exhaustion. What drives these animals to risk everything in the race of their lives? The miniseries reveals remarkable new scientific discoveries and only recently understood behavior — from a previously unknown zebra migration to an emerging modern elephant society of “orphan herds,” now learning critical life skills on their own. Using the latest satellite-tagging technology, a team of scientists and filmmakers can now track the precise journeys of individual animals, witnessing their daily life-and-death decisions first hand as they happen. For the first time, we’ll reveal the complete picture of these epic races — the successes, the failures and the near misses. This is no ordinary migration tale — this time we’re taking part. This is the extraordinary personal story of the most famous gorilla in the word who was adopted in the 1970s by Stanford University graduate, Penny Patterson. In a unique experiment, Penny taught Koko how to ‘talk’ to humans with sign language, in the hope that they might finally cross the boundary between animals and humans. After forty-four years, Project Koko is the world’s longest ape-language study and according to Penny, the most successful, with Koko mastering hundreds of signs. And after a lifetime together, Penny and Koko have a bond like that of mother and daughter. What started as a three-year scientific experiment continues as a love story today. Koko’s extraordinary life with Penny has been filmed every step of the way and we have exclusive access to this archive, much of which has never been seen before: her loves, losses, dating, unfulfilled desire to have a baby, rise to fame and encounters with Hollywood celebrities. Nearly half a century later, Koko is turning 44. Penny won her battle to keep Koko, but many questions still remain. To what extent can apes communicate with people? Are their emotions similar to ours? And what has Project Koko achieved? 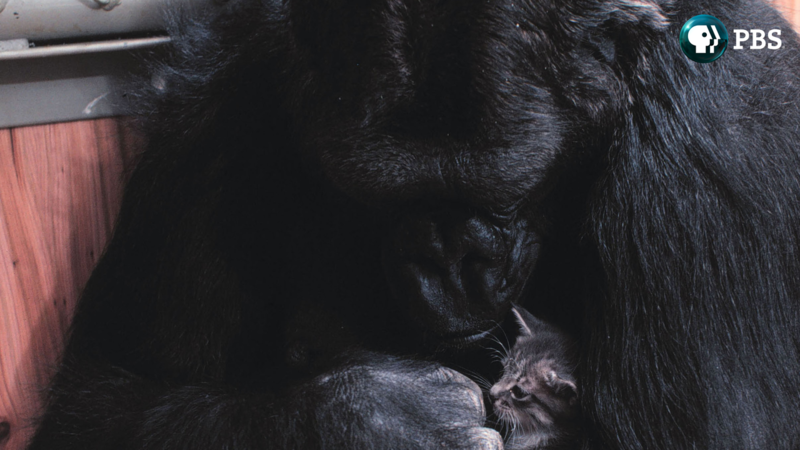 Koko and Penny’s story is a unique window into the emotions and feelings of another species. It is also an extraordinarily intimate account of a lifelong relationship between a gorilla and her devoted human companion. It is no wonder that people are mesmerized by MOUNTAINS, afraid of them and obsessed by them. They evoke wildness, yet remain a place of secrets. With each program focusing first on the Rocky Mountains, then the Andes and finally the Himalayas, this series will use drones to reveal the mountains as never before. The audience will be taken from hidden valleys to unknown peaks, with a chance to feel the vertigo, the cold and sense of wonder that these great ranges arouse. The series will show how the mountains mold the lives of the extraordinary animals and the remote people who live there. and how these great ranges create weather systems that control our planet. Illusion, distraction, trickery and disguise — deception comes in all kinds of guises. And it’s rife in the animal kingdom. Over three episodes, BBC presenter Chris Packham will explore how amazing new science is showing that cheating happens in almost all species alive, and revealing how simple tricks have evolved into complex and amazing deceptions. Survival isn’t always about being the biggest or fittest — some survival strategies are more devious, involving shape shifting, distraction and decoys. When finding food, the “hunger games” bring out the deceiver in an animal; Chris will explore the world of “aggressive mimicry,” where imitation is used to attack. When it comes to reproduction, trickery in the natural world is rampant. To win and keep a mate and rear offspring, animals use every trick, from adultery to cross-dressing. In this series, we’ll meet many duplicitous animals, including illusionist zebras, ventriloquist owls and a cross-dressing lion. All programs will be co-produced by the BBC and PBS. THE GREAT RACE and KOKO are commissioned by Charlotte Moore, Controller of BBC One, and Tom McDonald, Head of Commissioning, Natural History & Specialist Factual Formats. Craig Hunter is the Commissioning Editor on THE GREAT RACE. Tom McDonald is the Commissioning Editor on KOKO. MOUNTAINS and NATURE “Natural Born Hustlers” / World’s Sneakiest Animals are commissioned by Kim Shillinglaw, Controller of BBC Two and Tom McDonald, Head of Commissioning, Natural History & Specialist Factual Formats. Craig Hunter is the Commissioning Editor on MOUNTAINS and Tom McDonald is the Commissioning Editor on NATURE “Natural Born Hustlers” / World’s Sneakiest Animals.